[O]ur conscious capacity provides the biological basis for the generation of culture, including symbolic thought and language. Conversely, culture also provides the only explanatory mechanism that can unlock the distinctive nature of modern human awareness. Without deep enculturation, we are relatively helpless to exploit the potential latent in our enormous brains because the specifics of our modern cognitive structure are not built in. Our brains coevolved with culture and are specifically adapted for living in culture—that is, for assimilating the algorithms and knowledge networks of culture. In a sense, our brain design ‘assumes’ the existence of a cultural storage mechanism that can ensure its full development. This is the only feasible way to build a continuity theory of language evolution and maintain a smooth linkage with our deep evolutionary past. Cultural mind sharing is our unique trait. Human culture started with an archaic, purely non-linguistic adaptation, and we never had to evolve an innate brain device for language per se or for many other of our unique talents, such as mathematics, athletics, music and literacy. On the contrary, these capacities emerged as by-products of our brain’s evolving symbiosis with mindsharing cultures. Language emerges only at the group level and is a cultural product, distributed across many minds. This is why we have evolved such a novel evolutionary strategy, which relies on off-loading crucial replicative information into our cultural memory systems. 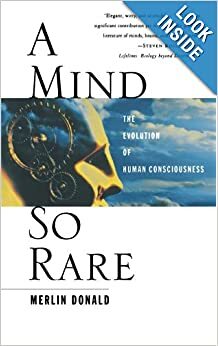 The algorithms that define the modern human mind may have been originally generated by collectivity of conscious brains living in culture, but these accumulated storehouses have now assumed a certain autonomy and have become an essential part of the mechanism by which we replicate, and continue to extend, the domains of our awareness. We have evolved into ‘hybrid’ minds, quite like any others, and the reason for this does not lie in our brains, which are unexceptional in their basic design. It lies in the fact that we have developed such a deep dependency on our collective storage systems, which hold the key to self-assembly. The ultimate irony of human existence is that we are supreme individualists, whose individualism depends almost entirely on culture for its realization. It came at the price of giving up the isolationism, or cognitive solipsism, of all other species and entering into a collectivity of the mind.